Bob Peters is not messing around. 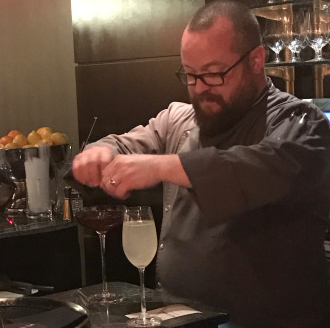 From his lair on the fifteenth floor of the Ritz Carlton in Charlotte, he is crafting cocktails. I normally stay away from the word “craft” these, days because it evokes artisanal micro-green salads and small batch kale tallow soap. Peters is a craftsman, though, and Mrs. Guitars and Gin and I headed up the big elevator one windy March evening to see the man in action and taste his wares. This entry was posted in Press and tagged article, bars, bartender, Best cocktail bar, Best mixologist, Bob Peters, bob the bartender, bobthebartender, Charlotte, cocktail, Cocktails, David Parker, Guitars and Gin, james beard, mixologist, mixology, outstanding bar program, punch room, punch room ritz, the ritz, the ritz charlotte, The Ritz-Carlton.